(The Living Building Challenge consists of 20 Imperatives or requirements for certification. Haleola'ili'ainapono introduces one more to address one of Hawaii's regional challenges. IMPERATIVE 21: 75% of this Living Building shall be built with reclaimed regional construction waste collected exclusively from the Hawaiian Islands) This is NOT a requirement of the ILFI’s Living Building Challenge program and is merely implemented to raise the bar while making an environmental statement. On any given day on any given street, this is the scene following the demolition of one of Hawaii's historic redwood single wall plantation homes. The most cost effective way to build a new house on an existing lot, is to get rid of the old house in as little time as possible. With an excavator like the one pictured here, this is typically done in a matter of a day. But at what environmental cost? The materials used to build these simple single-wall tongue & groove redwood homes have proven their resilience and longevity over the many decades. Redwood T&G, a byproduct of the Sequoia Tree, the oldest and largest species found on earth, possess a DNA with an endurance to mother nature's most challenging conditions. Having survived the ice age, redwood has developed an inherit resistance to mold, mildew, UV exposure, fire, disease, and bug infestation, all while developing an internal toxin that repels termites, making it an ideal building material for Hawaii. Should we not be celebrating this superior building material which can no longer be cut down? Instead we are hiring demolition contractors to crumple it up in a construction dumpster and haul it off to the dump. Haleola'ili'ainapono demonstrates how a more thoughtful and calculated deconstruction approach can provide an invaluable resource to achieving regenerative building design. When you experience the beauty and performance that this building material has to offer, you will be convinced that efforts should be increased to keep it out of the waste bin. 35% of Hawaii's waste is generated by construction demolition activity...that's 600,000 tons of demo debris. 400 homes are demolished each year on Oahu alone. Most of the waste is either dumped in the landfill, burned to make energy (while also generating carbon), or worse yet, bundled and shipped to the U.S. Mainland for another State to deal with. 70% or more of a single-wall house can be salvaged and diverted from the waste stream through thoughtful deconstruction techniques. The 21st Imperative is introduced by this Living Building Challenge project to address a regional issue here in the Hawaiian Islands. Due to Hawaii's isolation and lack of natural resources and manufacturing plants, nearly 100% of our building materials are imported into the State. The embodied energy required to harvest and extract the raw building material, manufacture it and package it for transport, then freight it to Hawaii is immense. Reclaiming and reusing the existing material extends its useful life while cutting its embodied energy footprint in half, and also eliminating the additional embodied energy that would be required to manufacture and ship in new product. Browse through the various materials that were reclaimed from Hawaii's regional construction waste streams to build Haleola'ili'ainapono, a Living Building. Alakona Corp. delivers recycled cold plane from demolished AC pavement to be used for base course material. Recycled base course makes for a great compaction layer beneath pervious pavers. This material is crushed and recycled from demolished AC pavement. The recycled cold plane was used to build the fire access lane and parking lot for the project. Visit https://www.alakona.com to learn more about recycled cold plane material. These reclaimed cobblestones from old Iwale'i Rd. 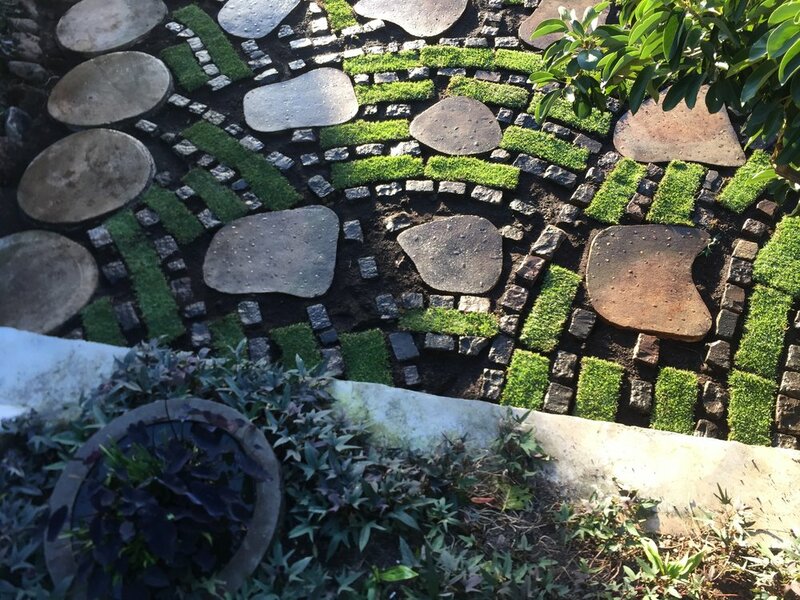 were cleaned up and installed in a fish scale pattern to break up patches of grass for this pervious driveway that doubles up as a fire access lane. Large concrete pavers removed from a house being demolished in Kahala are distributed throughout. In the foreground, a miniature fishpond and lo'i patch take sanctuary within a hallowed out pohaku (rock) removed from a house in Portlock. Purple 'gala (sweet potato) take root, sprawling out as ground cover while contributing to the project's urban agriculture plan. Hand-carved lava rock stones have endured decades of water flow. Large format hand-carved lava rock stones were once used by the Oahu Sugar Company to build irrigation flumes for sugarcane crops. The reclaimed stones were used to create this entry way landing which would also deflect any floodwaters that might approach the house. Reclaimed doug fir shiplap deconstruction from single wall homes was repurposed to make elevated battens for the building's roof assembly. Reclaimed bricks were removed from a residence to be repurposed as a support system for the redwood enclosure that will surround the aerobic treatment unit. The bricks are plenty strong and create an air space below the tank enclosure so that the wood doesn't rot out. Redwood decking removed from a house in Laie was reclaimed to make new decking material for Haleola'ili'ainapono. Old redwood decking being removed from house in Laie. Flip these bad boys over and good to go! Stacks of cedar tongue and groove paneling was removed from a house on Tantalus, only to be refinished and reinstalled into the ceilings of Haleola'ili'ainapono. Salvaged redwood jalousies were collected from various Hawaiian Islands and cut down and refinished to create new naturally ventilated window louvers. Composite decking was removed from a Delta Airlines maintenance facility at Honolulu International Airport. The decking boards were flipped over and reused to compose new decks for Haleola'ili'ainapono.